This post was done in partnership with Hot Pink Houston and H.S. Green, who provided me with complimentary food and drinks. I was not monetarily compensated for writing this restaurant post. All opinions are completely, 100% my own! So before I had second dinner at Loving Hut last week, I had first dinner at the restaurant H.S. Green. 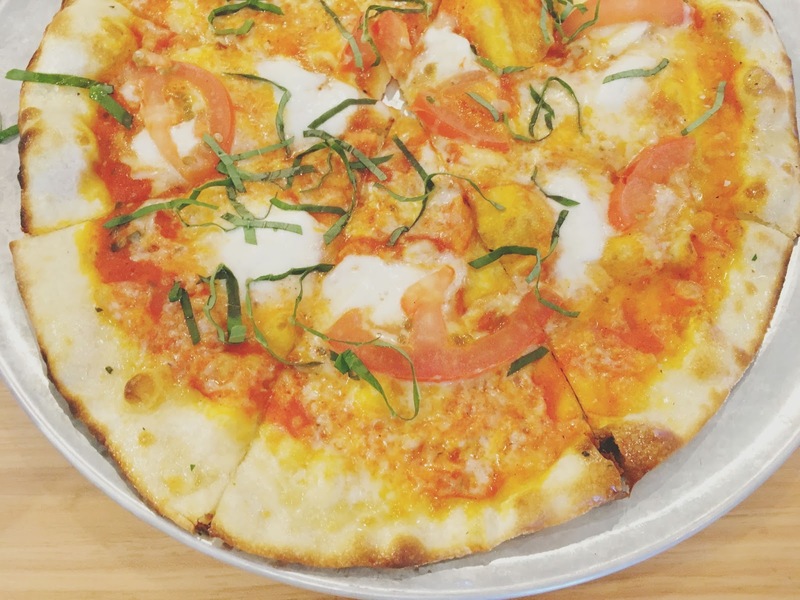 My friend Megha has an awesome Houston food Instagram account called HotPinkHouston (you should totally check it out, though let's be honest, you probably already follow her! ), and she's also an editor at The Daily Meal. 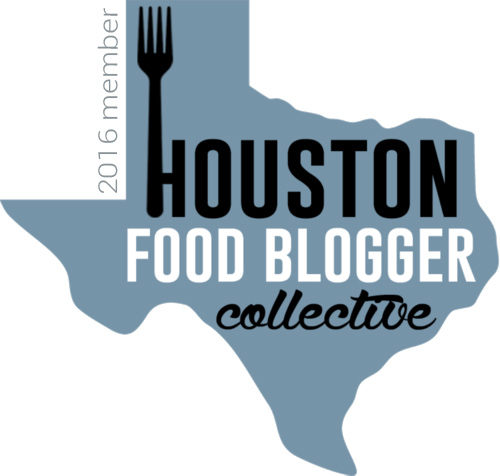 Last week, the folks at one of Houston's newest health food restaurants, H.S. Green, partnered with her to host a HotPinkHouston blogger event. And lucky me, I got to go! My Houston food blogger friends Erika and Sarah were also in attendance, along with a bunch of other new friendly faces! 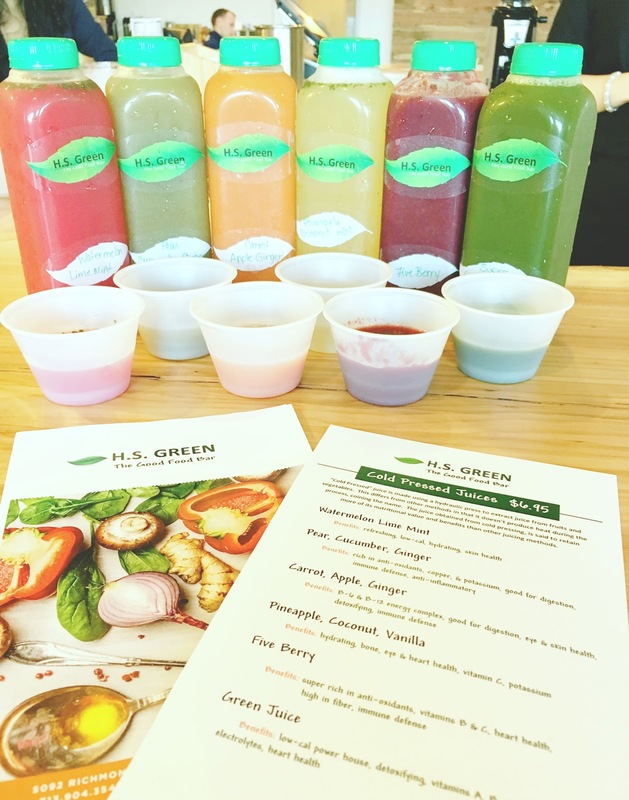 Before delving into solid foods, we were presented with six of the restaurant's cold pressed freshly squeezed juices to sample. Watermelon Lime Mint (benefits: refreshing, low-cal, hydrating, skin health) - This juice WAS refreshing. I love watermelon juice to begin with, and this was no exception. Tart, crisp, and citrus-y, it tasted just like summer! Pear, Cucumber, Ginger (benefits: rich in anti-oxidants, copper, and potassium; good for digestion, immune defense; anti-inflammatory) This drink was hearty, creamy, and had a rich pear taste. There was a hit of spice from the ginger, which was pleasant and incredibly complimentary of the other ingredients. Five Berry (benefits: rich in anti-oxidants, vitamin B, and vitamin C; heart health; high in fiber, immune defense) - This tart and jammy drink was perfect for the berry lover. It was probably my least favorite of the three, though admittedly I tend to shy away from berries in my juices and smoothies, so take that with a grain of salt. Other people seemed to really enjoy this one however! Green Juice (benefits: low-cal power house; detoxifying; replenishes electrolytes; heart health; vitamins A, B, C, and K) - This was essentially salad in a juice, and it therefore tasted very green tasting and grassy, but I mean that it in the best way possible. It tasted incredibly healthy, and I definitely enjoyed it! After the juice portion of the evening, the restaurant brought out some foods for us, starting with the guacamame. As the portmanteau <~~(I think this is my favorite word of 2016, even though it's been around forever. That, and the phrase "squad goals." ...how hard are you judging me right now?) 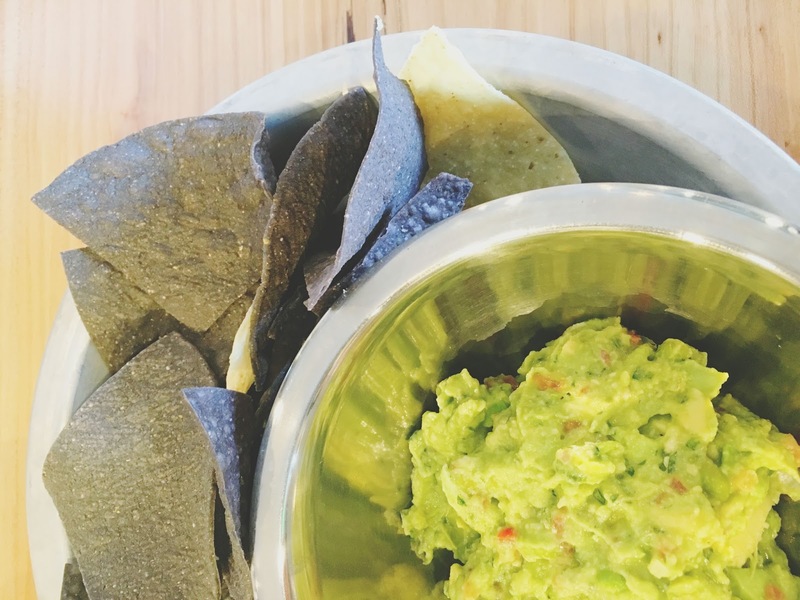 implies, the dip is a combination of guacamole and edamame, and was hella good. It was fresh, lime-y, chunky, and delicious! To be honest, I couldn't really taste the edamame, but I think it was in there more for texture, which was great. 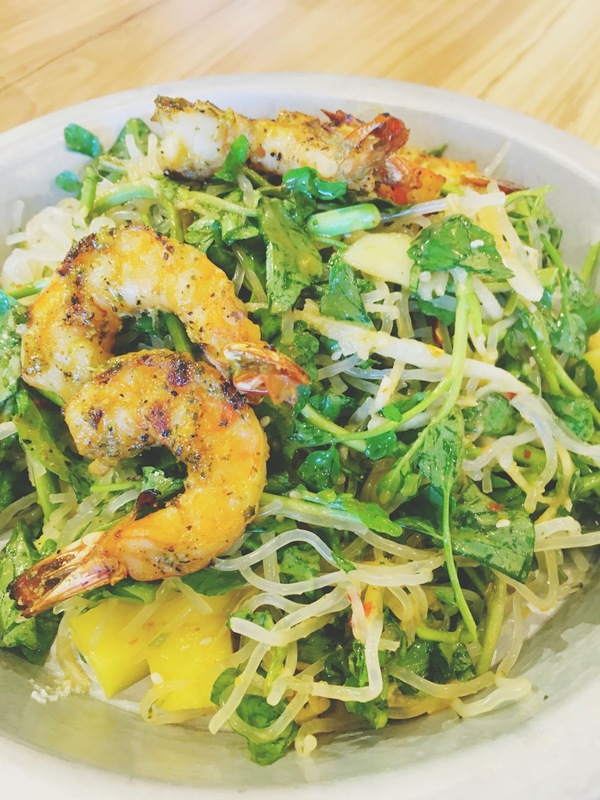 Next up in the solid foods department was the restaurant's Thai salad with grilled shrimp, as well as the quinoa edamame falafel. While I didn't try the salad, it smelled hauntingly delicious. The falafel (WHY is spellcheck wanting me to change that to "fella"? Spellcheck, you are obviously not a part of my squad.) came with a dill sauce on the side. I could taste the edamame this time inside the baked, smooth, earthy falafel. The dill sauce added a nice tartness and brightened the dish up quite a bit. 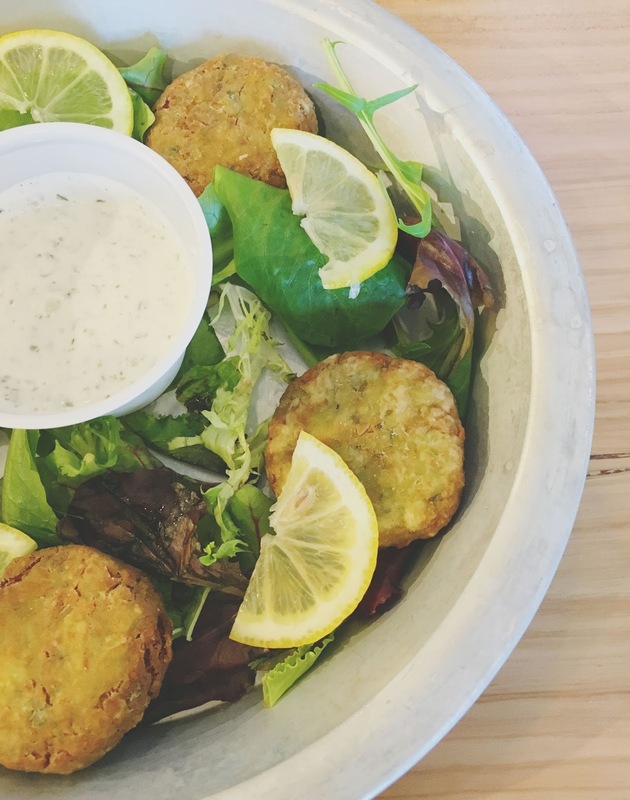 Because they were baked and not fried, the falafel balls were not of the weigh-you-down variety, but of the this-is-good-for-you-and-also-tastes-good variety. 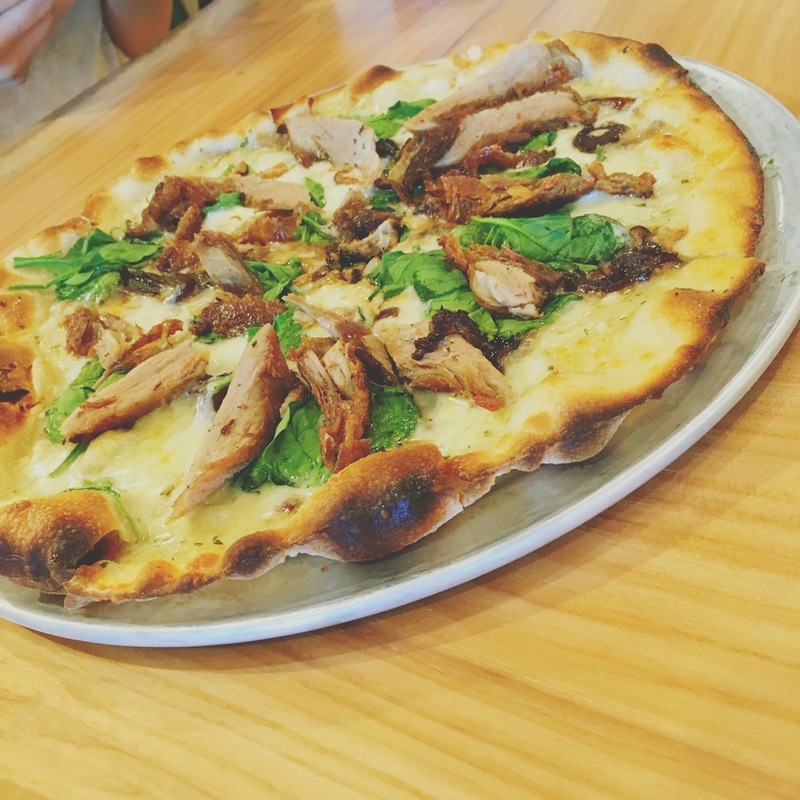 After that, we were presented with a crispy duck pizza, as well as the restaurant's margherita pizza. I didn't try the duck pizza, but the margherita pizza was lovely. It was insanely super duper thin, crispy, tomato-y, and light. Immensely flavorful, this was guiltless pizza at its finest! Before Erika and I had to cut out to make it to second dinner (Y'ALL, #HELPME), she snagged a bite of their truffle infused roasted mushrooms and chicken pizza, eating around the chicken. She informed me that I HAD to go back and order this at some point. Challenge accepted! 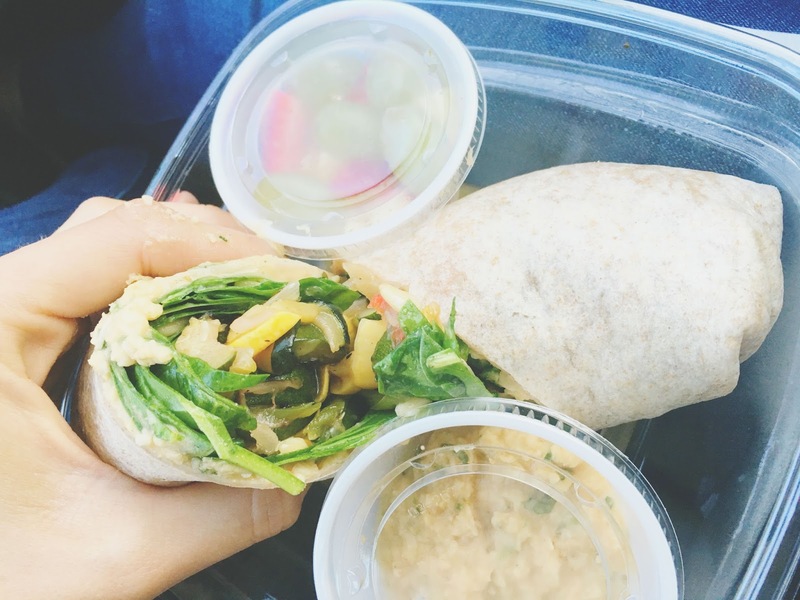 The zucchini, bell peppers, and red onion inside the wrap were vibrant, silky, and packed with flavor. Creamy, garlicky hummus and a crisp, mint citrus vinaigrette added a wonderful layer to it as well. It was quite the tasty lil' sammy! H.S. 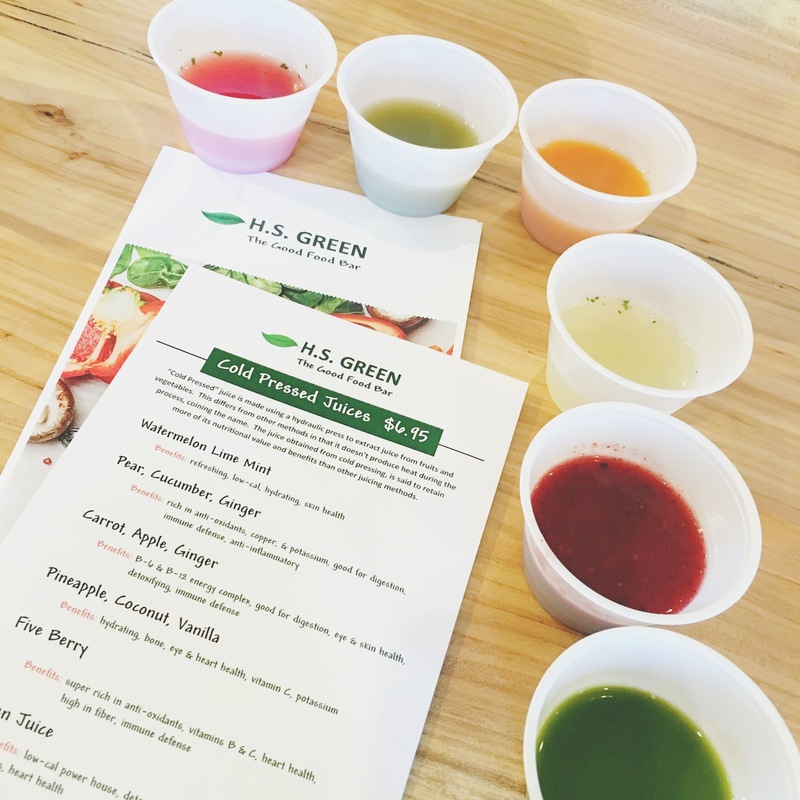 Green is a fantastic new addition to Houston's health food restaurant scene. Just because the food is good for you, doesn't mean that it's lacking in flavor, creativity, or the ability to satisfy. On the contrary, the food there is exceptionally tasty, unique, and gratifying! 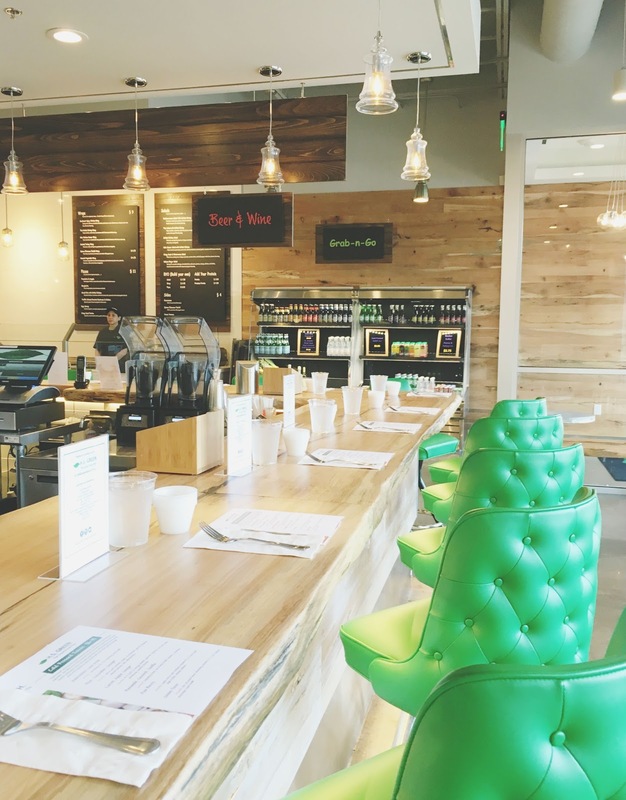 If you're in Houston's Galleria/Uptown area, and you're having a hankering for some high quality, delicious, healthy food, look no further than H.S. Green! I'm so excited! This place looks great and is super close to my office. Gotta try it. Kelly - Yes yes yes and yes, it is SO GOOD. Let me know what you think!! HAHAHA this is a GREAT review of the tasting, and thanks for pointing out that I ate around the chicken ;) true veg sisterhood right there!! !